A few days a month, we play hookey from preschool. My son Oliver is 5 and next year, he will officially be a kindergartener. It won’t be so easy to take days off then, so I do it now, while we can. Instead of driving off to his Waldorf school, we head the other direction to the Braddock Road Metro and ride the rails into DC. 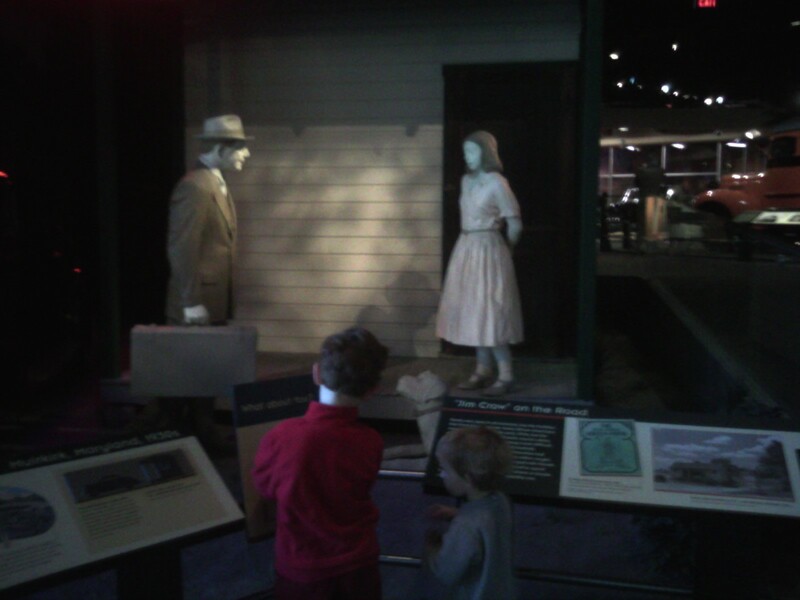 Usually, we go to the National Museum of American History and spend all our time in the transportation wing, which is full of streetcars, old-fashioned trains, buses, and glimpses of Americana through the 20th century. It’s a pretty amazing place. Usually these no-school days are great. We get to play a bit longer in the mornings and we stop for a special snack. I tried really hard to make today a fun day too, but there was much complaining by my five-year old despite the cinnamon rolls for breakfast and the ability to read in bed for a little while. I am in the last stages of a bad cold and my throat still hurts. I was tired today and I wasn’t sure how much stamina I had. During our outing, I kept looking at my watch, wanting to be somewhere else for some reason. I was aware that I wasn’t enjoying the present moment but could not shake a general sense of grouchiness, a feeling that we weren’t getting to see all that we needed to see at the museum. I was in a hurry despite the fact that there was nowhere else I had to be. I wanted to relax into the moment and into the day but I was annoyed by Oliver’s whining and the way he kept pushing his brother out of his way. “NOOOO!” Oliver yelled again. “YOU NEVER LET ME HAVE ANY FUN. IT’S NOT FAAIIRRR.” What I was thinking was: Haven’t I been letting you have fun all morning? I signed and started walking towards the museum’s front door. I thought of a post that Lindsey Mead Russell wrote about life being a poem and a practice. “Stop and breathe,” I told myself, but I was already huffing and puffing in my winter coat. The metro station was still a few blocks away, through the wind and the frigid day. “Mommy,” said Oliver at the front door. “Do you have my red hat?” I had given Oliver his hat while he watched the video. I had to put Gus down in order to zip up Oliver’s coat and Gus started to cry. “MOOOMMMMYYYY, CARRY ME.” Despite my best efforts, I was losing it. I felt an anger rising and then I was angry at myself for getting angry on a day that was supposed to be fun. I put all of my fury into zipping up Oliver’s coat. But I had momentarily forgotten he was still wearing it. I had not controlled myself. Again, I had failed. I can’t imagine what my face looked like to that woman. I only know what I felt. Shock, first. People in DC just don’t do that. That morning while waiting for the train, I complimented a woman on her coat and she just glared at me. Secondly, I felt immense pride and recognition. Joy. Could I really be a great mom? But that feeling was quickly followed by guilt. Oh, if only she had seen me twenty minutes earlier. I cringed a little, said thank you and shook my head, all at the same time. The woman nodded firmly at me and then she was gone, out those quick Metro doors. It all happened so fast that the boys hadn’t even noticed our exchange. Who the hell was that? I wondered. I thought about her all day: Why didn’t she speak? Why did she bestow such a kindness upon me, especially one that can never be repaid? I feel like that tonight. Disappointed in myself. Wanting to erase my shadow self as much as I want to erase Oliver’s. But it doesn’t work that way. Whatever I have tried to deny or cover up or not look at only grows that much stronger. So tonight I am trying to make peace with all that I don’t like about myself. I am trying to let it dissolve into the light. I am trying to remember that the source of ourselves is basic goodness. I am trying to listen to my soul, to that something that knows what to do, even if the mind I identify so strongly with does not. I am trying to trust in that soul, even if I don’t always hear its music. In a way, it’s like driving blind. Navigating by the stars. Driving a robotic car, already programmed and not much caring if you think you’re behind the wheel. Oh yes. yes yes yes. Me too. As a woman, as a mother, as someone who ends many days feeling as though I just wasn’t quite enough…Me too. Oh, Pam, I can relate to every single minute of this … the fury that swamps me, the regret, the surprisingly fast recovery into laughter. And that woman – WOW. What an immense gift she bestowed there, no? That kind of generosity astounds me – and inspires me to likewise give to someone who doesn’t expect it at all. I wish I could make your day better, but I can’t – I can only say I know just how you feel and from where I sit you ARE a great mom. You ARE, you are, you are. You are giving those boys so much of you. I can see it, I swear; I and I know as well as anyone how others can see things that we are totally blind to. So, at least for a moment, believe it. I’m relating to every word of this, too. Every word. The quotes you include, too. I’ve been thinking about love this month a lot and have come to this conclusion: love (in its purest form) is when you look on self or another without ego at play. I’m wondering if that kind of love is what we really mean by our souls, and how our souls know what to do, even when our minds do not. That IS a remarkable moment — in ANY city. Thanks for sharing it! Reminds me of how important our little acts of kindness and affirmation are to one another…and how perfect is THAT for Valentine’s weekend? Thanks for sharing the struggles of love with us! It’s hard enough when the people involved are grown-ups! It’s the honesty, authenticity and compassion you share that reflects our individual and collective struggle to be our best Selves and love all our kids together. Time marches on, the world is changing radically (and perhaps for the better, for the kinder, for the freer) and hopefully we can lovingly march together, supporting each other all the way. Thank you so much! Writing this blog, I kept thinking, Bruce is going to be so appalled. Thank you for your compassion! here for the first time… blown away by the reflections of parenting that are SO DIFFICULT. thank you. it always feels so good to know I’m not alone. recently I was thinking again about how wanting to have children can be so selfish. the unconscious longings to be fed instead of realistically standing up to bat- although we can never really know what we’re saying yes to in life, can we? including the gifts of strangers and the forgiveness from our children and the stark beauty in learning to love ourselves and them through it all. New to your blog. Such great insights on the struggles parents go through every day as our children do not behave or react in the ways we hope/expect them to. I think the fact that we are hard on ourselves simply shows that we are at least trying our best to be good parents and that we want the best lives for our kids. We also have to be able to forgive ourselves for being less than perfect, but I agree it is difficult. So glad the woman wrote the note and helped you to ponder the great things you are doing as well as the improvements that can inevitably always be made. You are currently reading Mothering at Walking on My Hands.